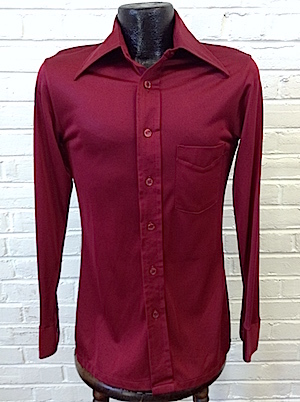 (XXS) Mens Vintage 70s Disco Shirt! Sleek & Shiny Raspberry! 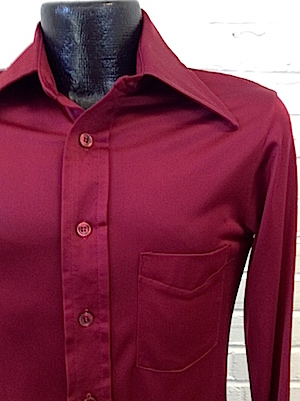 Home > Men's Vintage Shirts > All Men's Vintage Shirts > (XXS) Mens Vintage 70s Disco Shirt! Sleek & Shiny Raspberry! Mens vintage 1970s disco shirt. Sleek and shiny disco funk in raspberry! Has a super wide & pointy disco era collar. Closes in the front with pearly raspberry buttons with one matching button on the cuff. Shirt has one chest pocket and a straight hem. Tagged by Career Club. Triacetate/Nylon blend. Chest 32" XXSMALL. Tagged a Small, but we are measuring it at an XXSMALL.